After experiencing the driest second quarter (April, May, June) in recorded history, a dozen wildfires across the state, a wildflower-less landscape, and record breaking temperatures and dry wind, the rains have finally come. I’ve received nearly 3 inches of precipitation over the past 3 days. A little more is expected today. Now, of course, the weather service has issued a flash flood watch. 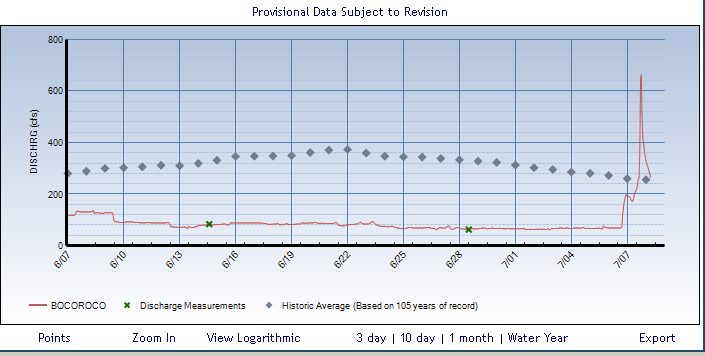 The graph below shows the flow in Boulder Creek east of the dam. Note that the water levels were about 1/4 of the historic average before the recent storms which are shown by the spike at the end of the graph. Boulder Creek Streamflow, click for larger. April, May, June are statistically our wettest months. Regarding the media coverage of forest fires, they commonly cite that the fires are worse due to the mountain pine beetle killing the trees. In one local case, they stated the fire was burning in a tinder-dry beetle killed forest, when I knew for a fact there were very few beetle killed trees in that area. They will stop at no lengths to sensationalize a story. The problem is, as we learned with the Bush administration, if you repeat something enough times, it becomes true in people’s minds. This leads people to thinking that the pine beetles have to be dealt with in some way. For example a large part of the forest near where I live, where people hike, camp, and ride bikes is going to be “patch cut”. Patch cutting is removing all of the trees in large areas, similar to clear-cutting. Remove the trees, and yes, the pine beetle “problem” goes away for obvious reasons. Pine beetles have always been a part of the forests here. They have been documented as being around for at least a hundred years and are probably a native species. Their job is to keep the forests from getting overgrown, just like natural fires. Based on my own observations, they don’t kill all of the trees. Thirty to forty percent continue to live. I’m always amazed by human arrogance in trying to control the natural world. So, they patch cut healthy trees, leaving the rest to be eaten by the beetles. Am I wrong or is this similar to burn the village to save the village? Yep, burn the village to save the village. Fortunately, not much impact here from the fires. I’ve been super busy with work, then had a friend visiting for a couple of weeks. I’m way behind on posting stuff. The media sensationalizes?!? When did this start? Thanx for the article. Someone once told me the beetles came from Japan as an invasive species. They failed to see the humor when I said I thought they came from England as a pop group. If/when you ever get unbusy we need to go have an adventure. I think there is a different beetle that originated in Japan. This one is native, but I’ll double check with an expert when he returns to Colorado on the 15th. As far as adventures are concerned, pick a day and we’ll start scheming.